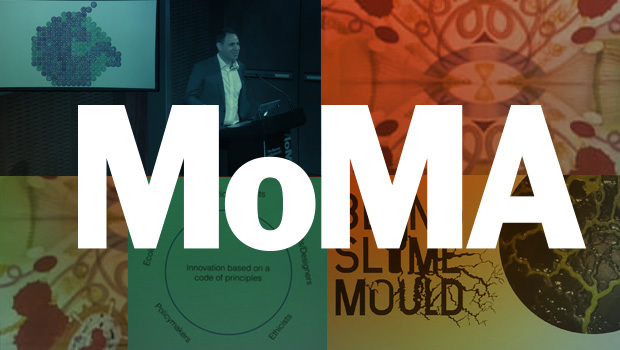 In October, CUT/PASTE/GROW’s Daniel Grushkin had the honor of being invited by Paola Antonelli, Senior Curator, Department of Architecture and Design of MoMA to participate on a panel focused on synthetic biology and design. Called “Synthetic Aesthetics: New Frontiers in Contemporary Design,” a crowd of designers, artists, scientists, and others gathered at MoMA to hear about design’s role in the emerging field of synthetic biology. Perspectives, possibilities, applications, and critiques were voiced by Dan, designer Daisy Ginsberg, architect David Benjamin, and researcher William Shih.